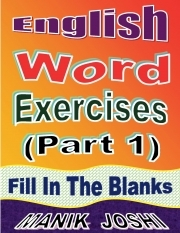 Description of "English Word Exercises (Part 1) : Fill In the Blanks (eBook)"
01. Decision to expel them has put the lives of their kids in j _ _ _ _ _ _ y. 02. He dismissed s _ _ _ _ _ _ _ _ _ _ s about his political ambitions. 03. He forced the Board to a _ _ _ _ _ n its working committee meeting last week. 04. She rushed to the spot after hearing the s _ _ _ _ _ _ _ _ g of car wheels and the commotion. 05. Intelligence agencies had failed to gauge the m _ _ _ _ _ _ _ e of the crisis and did not act in time. 06. It requires a lot of hard work to c _ _ _ _ _ _ _ e flowers since they have a limited shelf-life. 07. O _ _ _ _ _ _ _ _ n of women is a universal issue that has nothing to do with a certain nationality. 08. Protestors have agreed not to e _ _ _ _ _ _ e their agitation for next 10 days. 09. Rainfall continued in many parts for the second c _ _ _ _ _ _ _ _ _ e day. 10. Roof of her house had weakened by the recent spate of i _ _ _ _ _ _ _ t rainfall. 11. Several appeals are pending and many convicts are l _ _ _ _ _ _ _ _ _ g in jails. 12. Several localities received electricity for only a few hours and were p _ _ _ _ _ d into darkness for most part of the night. 13. Suddenly the tables started t _ _ _ _ _ _ _ g and paintings on the wall fell on the ground. 14. Tenders will be f _ _ _ _ _ d soon so that companies may be allotted the work by the next month end. 15. The prices of vegetables shot up e _ _ _ _ _ _ _ _ _ _ y in the recent past. 16. Their g _ _ _ _ _ _ _ _ s are being addressed by officials concerned. 17. There is a need to t _ _ _ _ _ _ _ m all the negativity into positivity. 18. Water-logging caused many low-lying areas to be s _ _ _ _ _ _ _ d under water, leading to traffic snarls. 19. We believe funds should be d _ _ _ _ _ _ _ d among those who really need it. 20. Wet and chilly weather h _ _ _ _ _ _ d relief work. Reviews of "English Word Exercises (Part 1) : Fill In the Blanks (eBook)"